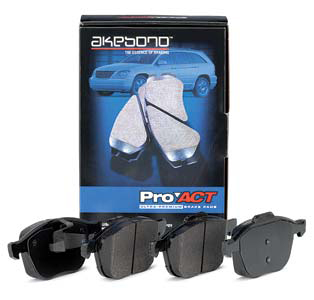 Akebonoâ€™s advanced ProACTâ„¢ Ceramic Disc Pads, original equipment on many of North Americaâ€™s most popular cars, light trucks and sport utility vehicles, are ideal OEM replacement components and the perfect performance option for drivers looking to upgrade from conventional pads. Akebono Ceramic Technology (ACT) helps to reduce the brake noise (squealing and grinding), vibration and harshness (NVH) problems associated with some aftermarket brake products. Ceramic technology also produces ultra-low dusting for cleaner wheels and tires and fosters minimal wear on the brake rotor. NVH control is further optimized by the fact that ProACTâ„¢ Ceramic Disc Pads are designed for specific models, as well as powder-coat finished and harmonically damped. All Akebono ceramic disc pad formulations are also asbestos-free.